For more than a century, U.S. immigration policy had been subject to the whims of political influence and public opinion. In 1924, due to an increasing anti-immigration sentiment in the United States, Congress passed a law that established quotas that, in effect, limited the number of aliens who would be allowed per annum into the United States. This would bode poorly for the Eastern European Jew, who wished to emigrate from an oppressive homeland, in search of greater opportunities to live their lives in a way they saw fit. With implementation of this new law, only 150,000 Eastern Europeans would be allowed into the U.S. each year. Many Jews who had previously sent family members to the U.S. expecting to send others and perhaps themselves at a later date, began to fear that this would be denied to them, separating them permanently from their loved ones. Many had seen the signs of this turning of public opinion years before and had already made a mad dash to other destinations. Others had to find other means. Some traveled to England, where the new immigrant did not have to concern themselves with quotas. From there, they could board another ship and complete the second leg of their journey by to a strange new world that promised opportunity and success with hard work. The United States awaited their energy and their spirit. Though the vast majority of emigrants traveled to the United States, others went to countries like Cuba, where, until 1924, immigrants were given citizenship to anyone who lived in their country for one year. Some stayed, but many waited there until a more favorable U.S. immigration law was passed, so that they may then make a legal entry and eventually become proper citizens. The mass migration of Jews to the United States occurred in two major time periods. The first wave was, for the most part, due to the pogroms in 1881-2, and culminated in 1892. Many left during that time to escape the massacres, pillaging and other atrocities that befell the Jews. Also, in 1887, the Czar chose to place educational restrictions on Jews and had his forces expel many Jews from their villages. The second period of migration began for various reasons. There was the Kishinoff pogrom and massacres of 1903 and 1905, the beginning of the Russo-Japanese War in 1905, and the outbreak of even more devastating pogroms in 1906, when more Jews were killed by roving bands of Cossacks. In 1906, the year that the number who emigrated had reached its apex, my grandfather Harry Ness came to the U.S.; his wife Flora Burak came a year later. Most Jews wanted to leave Eastern Europe then to escape the many hardships that they had to face on a daily basis. Many young men and women desired to pull themselves out of poverty. Others wanted desperately to avoid the draft and conscription (remember the Russo-Japanese War) into the Russian or Polish Armies. Many wished simply to fulfill whatever dreams they had for a better life. Unfortunately, their emigration often caused a lifelong separation from their family, especially their aging parents, many of whom grew habituated to where they were living and their traditional way of life, and would not leave. My great grandmother Sheina Gittel Burack would not leave Poland in the 1930s, even though all but one of her children had already done so, and were living in the United States. After 1888, the czarist government unofficially permitted millions of Jews to leave. However, it was very hard to them to obtain passports legally. Many regional boundaries that an emigrant would have to cross to reach port where they would need a passport had their own rules and regulations, and every official wanted to get as much money as they could. If you wanted a passport in less than three months, it could very easily cost a lot more. Emigrants most often would have to cross over German borders in order to get to one of the major ports in northern Europe. Trying to get to the port was risky business. Often border guards would have to be bribed so they would look the other way. Agents might have had to be hired to sneak the emigrant across the various borders. Once at the port, they would have to bide their time until it was time to board their ship, most likely destined for some port in the United States. Some decided to board whatever ship they could, regardless of their preferred destination, just to be know that they were on their way to leading a new life somewhere else. In 1913, a ticket on a steamship could be bought for thirty- four dollars. Most often the port of departure would be Hamburg or Bremen, but many also left from Rotterdam, Amsterdam or Antwerp. Before boarding the ship for the long sea voyage, they would have to pack a shoulder bag filled with food and water-- perhaps a few loaves of bread and some cheese. They could not count on being able to obtain any food during their journey. Many Jews were aided in their journey by agencies that were set up in Western Europe. These organizations were eager the help out their fellow Jews, but at the same time they had mixed feelings. They might have been afraid that a massive influx of Jews would negatively impact their countries. Most Jewish immigrants from Eastern Europe flocked to the larger cities in America, e.g. New York, Philadelphia, Boston and Baltimore. Often it was the Jews of Germany who would help the emigrant with their trip west, away from continental Europe. There was an organization called "The London Manor House Committee" that would get the traveler to America, where American Jews would take over and get the new immigrant settled in a place to stay and perhaps find them a job. The trip across the Atlantic Ocean to the east coast of the United States could take between ten and twenty days, depending on weather conditions and the number of stops the ship would make. The immigrant would generally be traveling the least expensive way possible, which meant a space in the steerage section of the ship, each compartment holding up to three hundred people. When they boarded the ship, they would have little idea what kind of weather to expect, and many times they would have to suffer through rough seas and overall terrible conditions. Yet between 1905 and 1914, 700,000 Eastern Europeans passed through German ports on their way to their destination. Most often their destination was the United States, and seventy percent of the time these immigrants entered through the port of New York. At the port of embarkation all who wished to undertake such a journey had to be examined by a physician. This was not done as much at the beginning of the period of immigration, but the rules had changed. If a steamship company brought a person with a contagious disease to a U.S. port, the company would have to return this person to their country of origin at their own expense. Often the ships would make more money on the volume of emigrants they took on board than on the regular paying passengers. Many German ships had been carrying raw materials from the U.S. to Europe, but often returned back to the U.S. with a much emptier hold. So the steamship companies decided to offer transport to those wanting to immigrate, and they built very simple beds in dark and cramped quarters to hold them. There was very little room for luggage or personal effects in steerage. The beds were in berths that were barely six foot long, with pillows, if supplied, that were filled with straw. Whatever blankets were given to them were so flimsy as to do little to keep them warm. The food that was served on ship was often moldy and in such poor condition as to make it undesirable. And often when a person would be seasick, he or she would not even be able to eat. Imagine the predicament for the observant Jew that wished to remain "kashrut." Even when the shipping company would say the food was kosher, this was often brought into question. The ship’s crew never cleaned the compartments. There were no garbage cans for leftover food and the floor would often be littered with all kinds of items. There were no cans for those who got sick on the ship, and seasickness was a common occurrence. How difficult it must have been at night trying to sleep when the seas were rough, lying in bed, rocking back and forth, one’s mattress sliding from side to side. There were not even enough toilets or washbasins for the number of people living in those quarters. The place must have smelled horribly! At least during the day, many would go onto the deck when they could, and sing old Russian folk songs, or dance. It would be good and give one joy to be out in the fresh air, especially when the weather was pleasant and the sea was calm. Most often, immigrants would choose to travel by sea in springtime, and second most often by autumn, and of course, the least preferable season was wintertime. They would talk among themselves about what they were hoping for when they live in America. Perhaps they would talk about owning or working on the land, or about the schools and synagogues they would build. Can any of us imagine what it must have felt like for our immigrant ancestors to leave their homes and traditional way of life, find their way across Europe to a ship, take a sea voyage for two weeks or so, never before having left their villages? Many believed that they would never see their loved ones again, especially the elderly members of their family. Most had little experience traveling, had to sell many of their valuable possessions to raise whatever money they could for the trip, and were forced to share a compartment with too many strangers for too long a time. By 1913, the year that Max Burack emigrated, the duration of the average voyage from Western Europe to the U.S. was reduced for many to nine days (though it still took Max twelve days to reach New York). This of course was good for the emigrant, not just because the number of days that they would have to suffer in steerage was decreased, but this also cut down on the potential for infectious disease to spread. This had been the main cause of death aboard sailing ships, which had been the main means of crossing the ocean to America before the steamship came along. 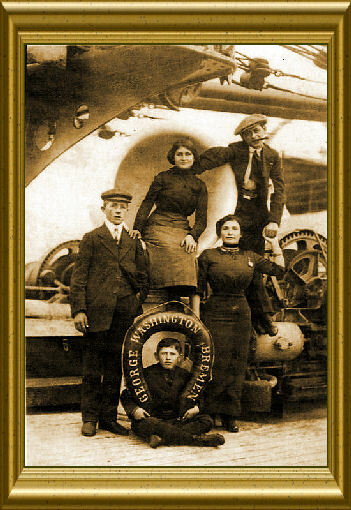 The use of steamships to bring immigrants over to the U.S. reduced the mortality rate by ninety percent. An important piece of legislation that affected those who wished to immigrate was the Immigration Law of 1924. This law put restrictions on the number of aliens (permanent quotas) allowed into the U.S., especially from Europe. There was also a quota based on each nationality’s contributions to the overall U.S. population. Only 150,000 people were allowed to emigrate to the U.S. from Europe per year. Originally an Emergency Quota Act was passed that was supposed to be a temporary measure, and it was supposed to expire on June 30, 1922. There was a lot of anti-immigrant, anti-cultural pluralism feeling in the States at the time (not just Jews), and this Act would give our government enough time to debate the issue of immigration. But the debate did not end by this date, and the Act was extended another two years. Also, rumors had made their ways throughout the shtetls and cities in Eastern Europe that the U.S. wasn’t going to allow any more immigrants in, or at least the men might be permitted to immigrate, but not the women, so then, in effect, women wouldn’t be able to join their husbands who had already immigrated ahead of them. So many made a mad dash to the Northern European ports to sail out on Northern European vessels before it was too late. On May 21, 1924 Calvin Coolidge signed into law this Immigration Act, requiring for the first time that potential immigrants obtain "visas" from U.S. embassies overseas before leaving their native lands. This way the U.S. wouldn’t have to turn away immigrants on their own shore. Because of this requirement, Ellis Island was no longer needed to inspect those wanting to enter the U.S. through New York, and it closed down as an immigration receiving station in 1924.